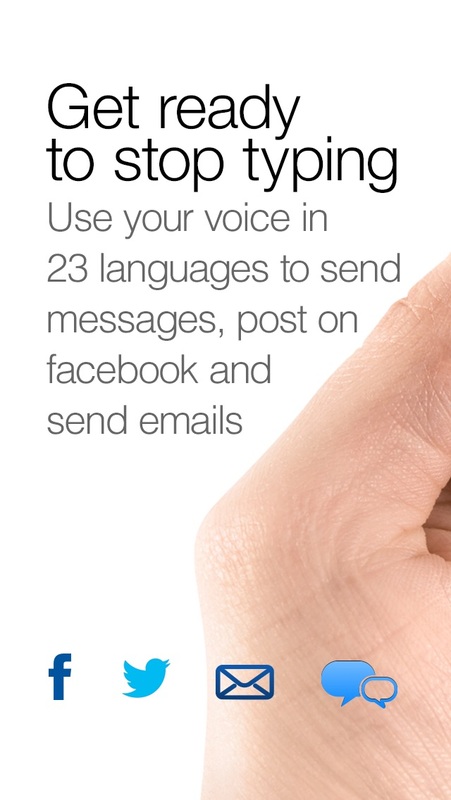 Get ready to stop typing. 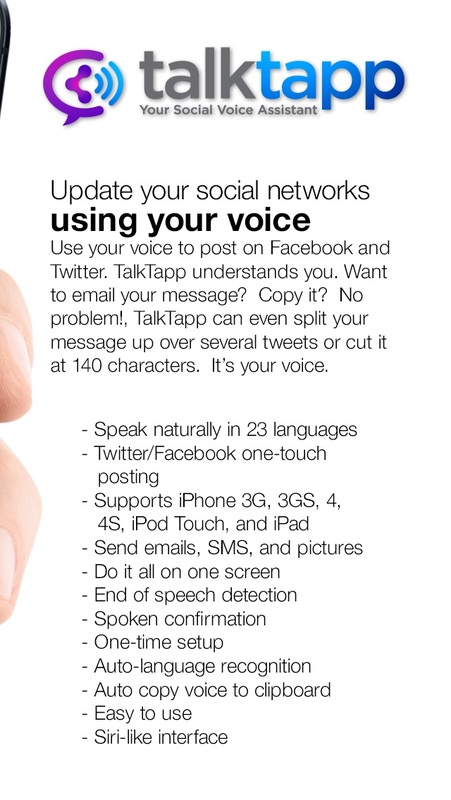 And use your voice to update your social networks. 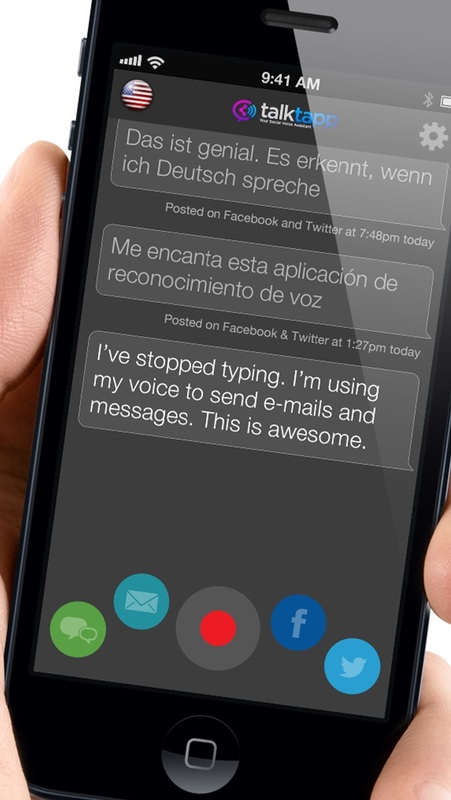 You can now use your voice to update your social networks, send emails, messages, and more. TalkTapp speaks your language. Just talk to TalkTapp and tap the button to broadcast what’s on your mind via Twitter and Facebook. Featuring Nuance, the most advanced voice recognition software on earth, TalkTapp is the new tool from the nuts at Pinch Multimedia that will improve the way you connect to the world – forever. Just TALK and TAP. It’s that easy. Use your voice to post on Facebook and Twitter. TalkTapp understands you. Want to email your message? Copy it? 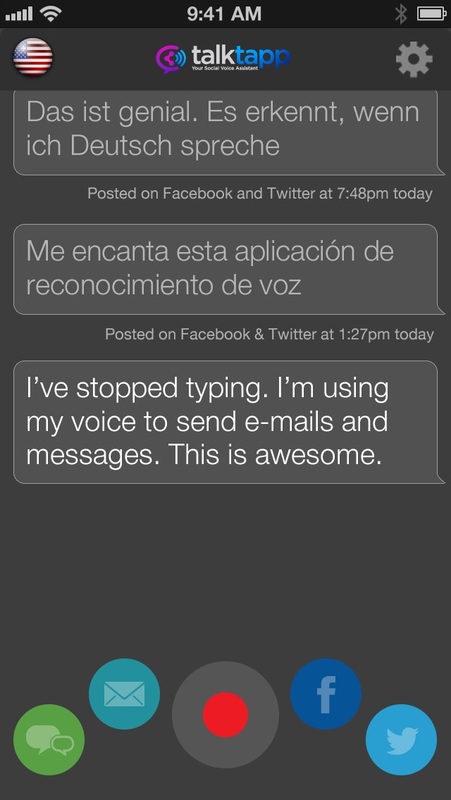 No problem!, TalkTapp can even split your message up over several tweets or cut it at 140 characters. It’s your voice. TalkTapp’s voice recognition features more than 20 languages. Post in English, en Español, in Deutsch, en Français, and many more. You decide how you want to be heard. Want to change it up? 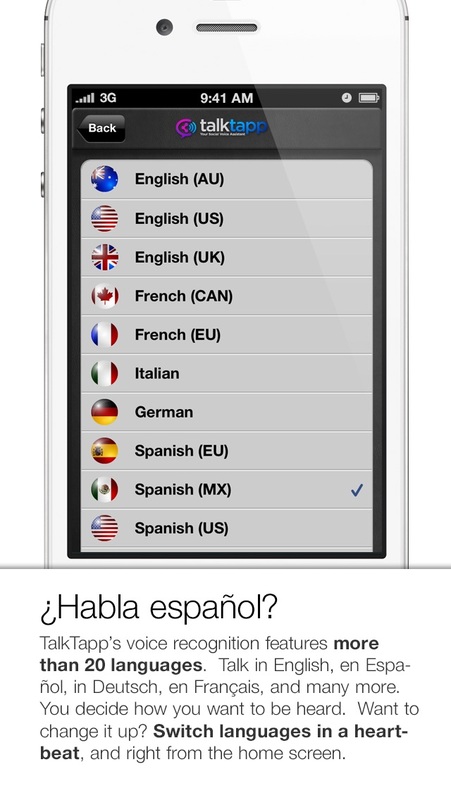 Switch languages in a heartbeat, and right from the home screen. TalkTapp is the only app that lets you add pictures to your posts across both networks. Just TALK and TAP so your friends can see your grinning mug while they read what’s on your mind. You decide who gets what, how, and when. Sick of wrapping your car around trees and telephone poles alike? Go hands-free with TalkTapp. Just TALK and TAP. You’ll never have to take your eyes off the road again. Plus, who really likes chatting with cops?